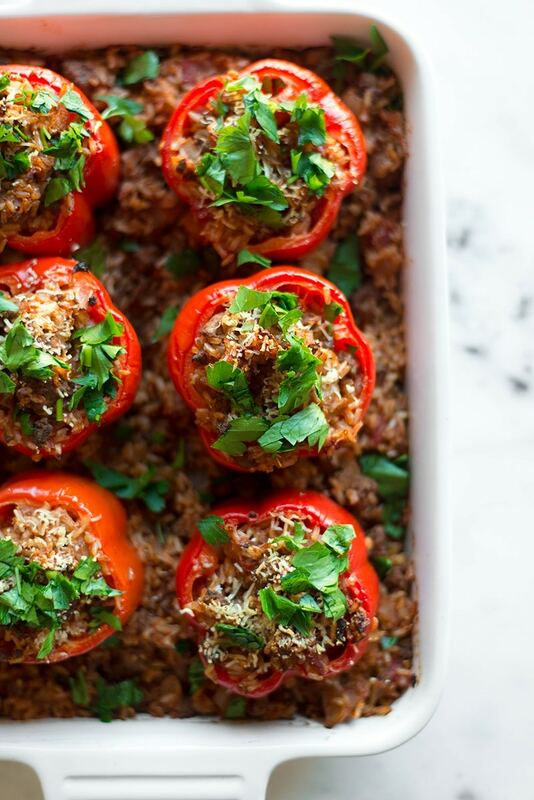 These easy Stuffed Bell Peppers are a hearty but healthy comfort food from my childhood that is family approved and can be made ahead for an easy weeknight meal. 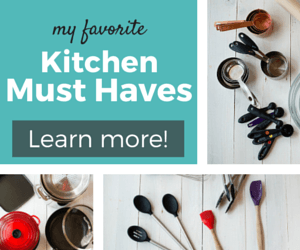 Perfect for left-overs, too! There are always those recipes that stay with you from childhood, no matter how long it’s been. Comfort food is interesting that way. I’ll always remember enjoying my mom’s stuffed bell peppers, nachos, and corned beef and cabbage as long as I live. These memories are so heart-warming and familiar, it’s hard to believe we can go so long without them, yet the memory is so strong. Since I live states away from my mom and my need for comfort food is real, I wanted to create my own version of the stuffed bell peppers recipe she used to make. While hers was pretty healthy, I made a few changes to add in some additional fiber and remove some of processed foods. 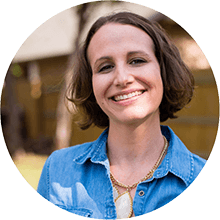 For example, my mom would use white rice, but I’m always partial to brown rice as a super easy and high-fiber, unrefined alternative. 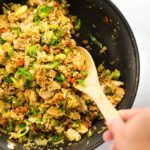 You could choose another grain or quinoa as well, but the rice does provide a real creamy, yummy texture for the stuffing. It’s crazy how easy these bell peppers are to make, even just from memory. The whole recipe is quite forgiving so you can add an extra ingredient here or leave out another there and it’ll still be delicious. You could also use the filling to stuff tomatoes, zucchini, spaghetti squash, or whatever you happen to have on hand, though I’m def partial to the bell peppers. On that note, I like red or green bell peppers the best for this recipe, but any will do. 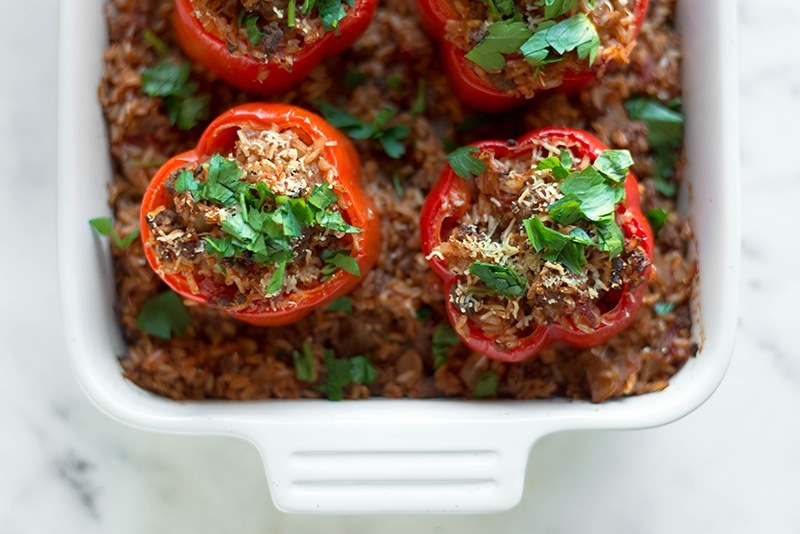 These Stuffed Bell Peppers can be stored for up to a week in the fridge and will reheat perfectly. 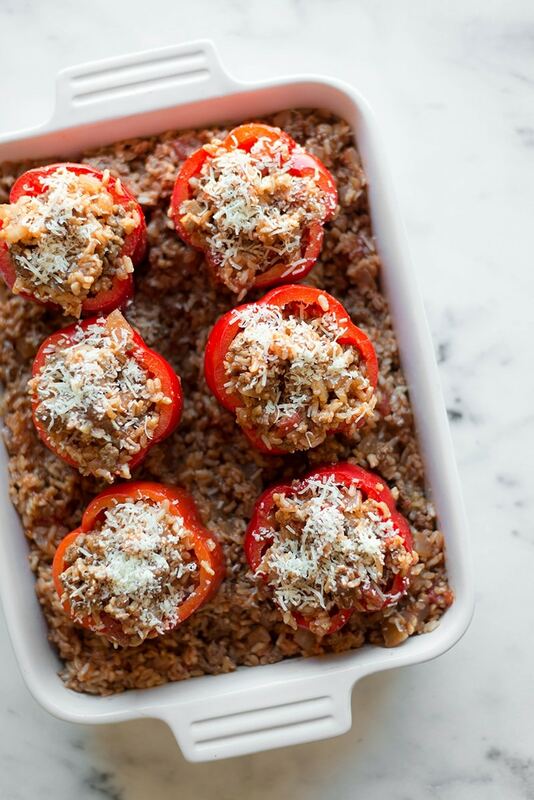 If you’re interested in meal prepping for the week, these stuffed bell peppers are a GREAT option. In fact, I happened to use these babies in my $75 Whole Foods 5 Day Meal Plan in case you’d like to check it out. 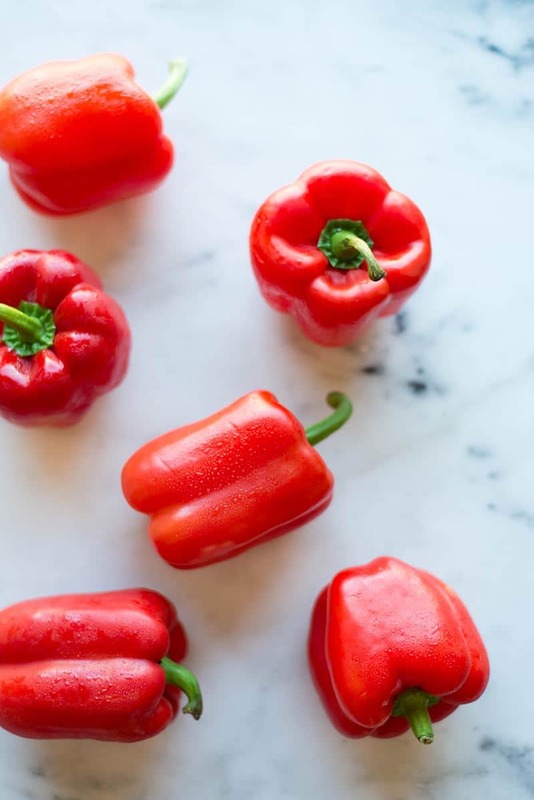 If you are reheating a make-ahead stuffed bell pepper, a quick tip is to slice the whole pepper in half before heating as this will make it a lot faster to reheat. I store theme in these meal prep containers. Cook the bell peppers according to the recipe. You want everything to be completely cooked through before freezing to make it easier and quicker to reheat later. Once cooked, allow the stuffed bell peppers to completely cool before freezing. The best way, I’ve found, to freeze stuffed bell peppers is to freeze them in a large casserole dish that is freezer-safe. 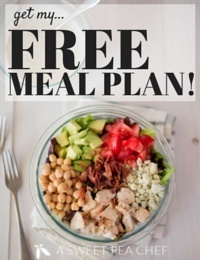 This will make it much easier to grab and go when it’s time to reheat. Cover the casserole dish with aluminum foil and then wrap the entire dish in plastic wrap to completely seal. Any open areas will lead to freezer burn which we don’t want. 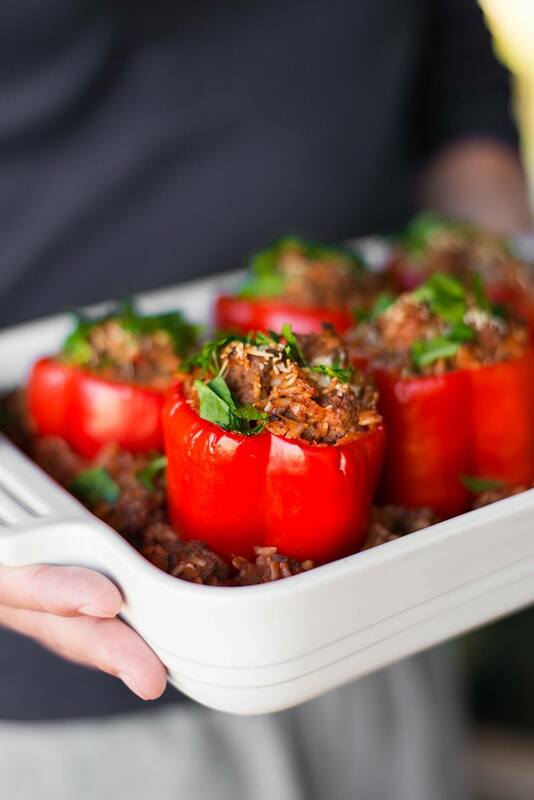 When you’re ready to enjoy these easy stuffed bell peppers for a tasty dinner, just remove all the wrapping and bake, frozen, at 350 degrees F until they are thawed and heated through, about 45 minutes to one hour. If you’d prefer, you can also thaw them in the refrigerator before cooking and they will heat through faster. Nowadays, I get to enjoy this comforting meal with three kiddos and think back on my own happy childhood memories at the same time. What is it about comfort food from our childhood? Is it just a food we enjoyed that our mom or dad or grandma made for us? Is it just that is was familiar and so it became comforting? Or was there something so special about that moment in time where we were cared for and the food just created that memory? 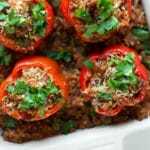 I sure hope you enjoy these bell peppers – they’re simply delicious and a great weeknight dinner that can be used for lunches throughout the week as left-overs. Just one pepper is all you need for a meal, which makes it go far and cuts down on cost, too. So yay. What are your cherished comfort foods from your childhood? 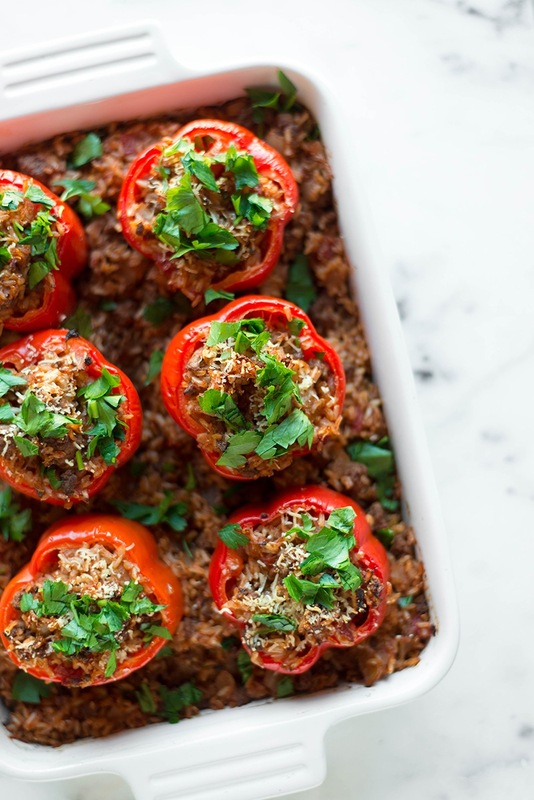 These easy Stuffed Bell Peppers are a hearty but healthy comfort food from my childhood that is family approved and can be made ahead for an easy weeknight meal. Perfect for left-overs and freezing, too! In a deep pot, heat the brown rice with low sodium chicken broth over medium-high heat. Simmer, covered, for about 20 minutes or until rice is mostly tender. Now, in a large, deep skillet over medium-high heat, add olive oil and allow to heat up. Add the lean ground beef, diced yellow onion, minced garlic, sea salt, black pepper, chili powder, dried oregano, and paprika and stir to combine. Cook until the meat is well-browned and the onions are tender, about 6-8 minutes. Next, add the diced tomatoes, tomato sauce, and cooked brown rice (should be approximately 3 cups) and stir to combine. To prep the bell peppers, carefully slice off the tops of each bell pepper, leaving as much of the pepper as possible. Then, clean out each pepper and wash thoroughly. Gently spoon mixture into hollowed-out peppers and top with shredded parmesan cheese. If there is extra stuffing, you can spread it around the peppers in the baking dish. Place in the oven and bake for 45 minutes, or until the peppers are tender. Can be frozen for up to three months. 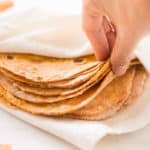 When ready to eat, place in the oven, frozen, and bake at 350 degrees F until they are thawed and heated through, about 45 minutes to one hour. This post contains affiliate links to products I use regularly and highly recommend. 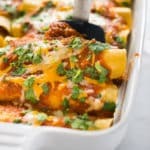 One of my favorite recipes now. I used your stuffed pepper recipe as my rubric this evening, having plucked the two fattest bell peppers we’ve grown so far. I dialed down the tomatoes to avoid whining and burping from my otherwise perfect spouse. Plus, I filled two fattie tomatoes with the stuffing – adding cheese for their innards. 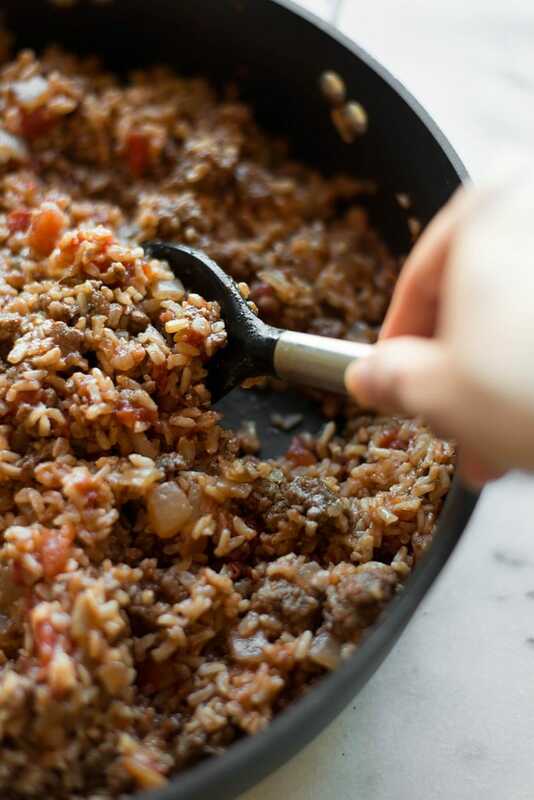 Adding mild Italian sausage to the beef lent a zesty layer of flavor. In order to as a couple serranos, I chopped them in the little processor; adding onion, shallot, spinach, chard, green onion, and a can of diced tomatoes with green chiles. That liquid went into the meat mixture to make friends while I waited for the red rice. A five-minute blanch for the peppers won over the microwave, but softening them is a great idea ~ should have been a no-brainer. I’ve made some rather lame stuffed peppers in my day, and I believe I’ve figured out why! So I sneaked in extra veg with the processor mixture, then added more sauteeing the meat…and even more when I chunked in the rice. These were the yummiest! Now I’ll be checking out your other recipes. In fact, when my phone reloaded this page, it displayed your bio blurb, so I now see that my message to you is going to head up and out into cyberspace before speeding its way back down to Austin, my hometown! Thank you again. Great recipe. Metal roofs are on its option to recognition. Lacey! I’m your biggest fan!!! 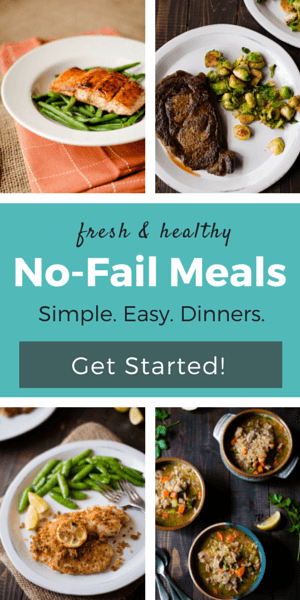 I’m always surprised you use canned food (contain BPA) in your recipes. Can I use chopped tomatoes instead? 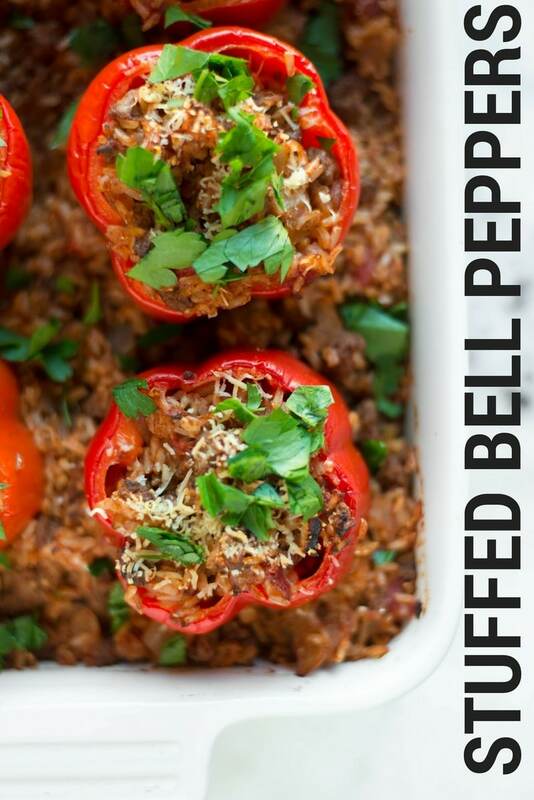 This is my go to recipe for stuffed bell peppers and I love how it turns out (sometimes I add a dash of Worcestershire sauce). I wanted to know how you came to 450 calories per bell pepper if you make 6 stuffed bell peppers with the recipe. When I added up the calories, it came out to about 250. The recipe turned out delicious! Great for leftovers as well. Did not have have Worcestershire sauce, so used A1 sauce as a substitute. I have been trolling the internet for stuffed bell pepper recipes this fall because we have had a bumper crop of bell peppers. This is hands down the best one I have tried! 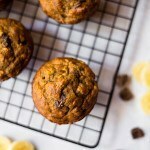 We loved them and your recipe! The only variations I made was to par-boil the bell peppers before stuffing so they don’t take so long to bake, and my husband added 1/2 lb of ground sausage. I don’t think either one of these variations made a substantial difference in the final product. Thank you for this delicious recipe! You are so very welcome, Diana. I’m so glad you guys enjoy this recipe — your variations sound great, too. I love stuffed bell peppers, but takes a bit long in the oven for an after work meal. I think I’ve seen it before as a hash type dish. Could I just cut and cook the peppers separately and add it to the meat, rice tomato part? What would be the best way to do that? Hi Janna! My mom actually used to make it this way for a quick weeknight dinner. Tastes the same and saves time, too! You could definitely cook the peppers separately if you’d like, but I think she used to just throw them all in together (large-chopped, of course) while the meat was browning so they cooked along with the rest of the goodies to get the most flavor. 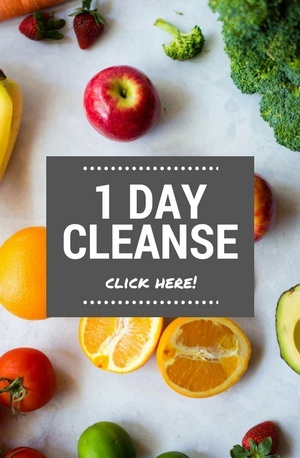 If you try it out, I’d love to know how it turns out for you. Good luck! Hi Kim! So glad you’re gonna make these peppers! I hope you and your husband enjoy them. I actually have made cabbage rolls a LONG time ago, but I have not in a while. They sound good and I will look into posting about them. Thanks for the idea! Stuffed bell peppers was one of my favorite things to eat as a kid, and I’ve been looking for a good recipe. Thanks for sharing. Good luck with all the craziness! Glad to help, Lelah! Thanks!